Montessori Children's House | Horsham Montessori Receives $1,000 Grant! Horsham Montessori Receives $1,000 Grant! 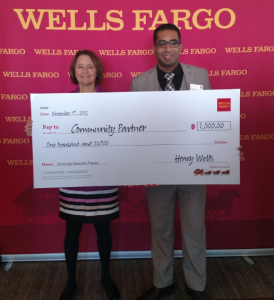 Wells Fargo’s Community Connections Giving Program is an annual program where each of its retail banking stores explores the needs of their local communities and selects a nonprofit organization or school to receive a $1,000 grant. This year, Wells Fargo will award close to $300,000 in grants to nonprofit organizations and schools throughout Pennsylvania. Montessori Children’s House in Horsham was fortunate to be chosen to receive a $1,000 grant from the Community Connections Giving Program. Cassandra Hollaway, Assistant Manager of the Wells Fargo in Horsham and a Montessori Children’s House parent, deserves credit for recommending Montessori Children’s House for the program. The support of parents like her and the local Horsham community is what allows Montessori Children’s House to continue to provide a quality education and program. On November 10th, Wells Fargo hosted a breakfast to present the checks to the organizations and schools chosen to receive the grants. Preston Ferguson, Bank Manager of the Wells Fargo in Horsham, presented a check for $1,000 to Nona Melnick, Principal of Montessori Children’s House in Horsham. Upon receiving the check, Mrs. Melnick commented how thankful she was to be chosen to be part of this great program and how grateful she is to have the support of parents like Mrs. Hollaway. The grants are part of the company’s broader support of its communities. In 2014, Wells Fargo invested more than $13.4 million in nonprofit organizations and schools and team members volunteered more than 57,000 hours across Pennsylvania.